I had a very pleasant few hours yesterday. I joined a local walking group for a “bluebell” walk, on the border country of Herefordshire. As we set off we were informed of a fact that I had never heard before – bluebell sap was used by the British archers of old to glue the “fletches” (feathers) to their arrows. Bluebells are an indicator to the ancient status of most of the woods they inhabit. We tramped off from the parking area in biting cold wind climbing quickly through wet and muddy cattle pasture and soon warmed up with the effort. Shortly we reached a wet and equally muddy woodland path and had to negotiate a very steep and slippery path down to a wooded valley and brook. I was so pleased I had taken my walking pole for support as a number of the party ended up sitting in the mud before they reached the valley floor! But, it was all worth the trips and slips as we could see when we entered the nature reserve and further on privately owned managed woodland. Everywhere about us was bright and thick with colour. Although it was bit early for bluebells and they were only just coming into bloom the woods were thick with spring flowers. Bluebells, wood anemones and primroses in profusion. The largest clumps of wood sorrel I ever seen down on the edges of the woodland stream. 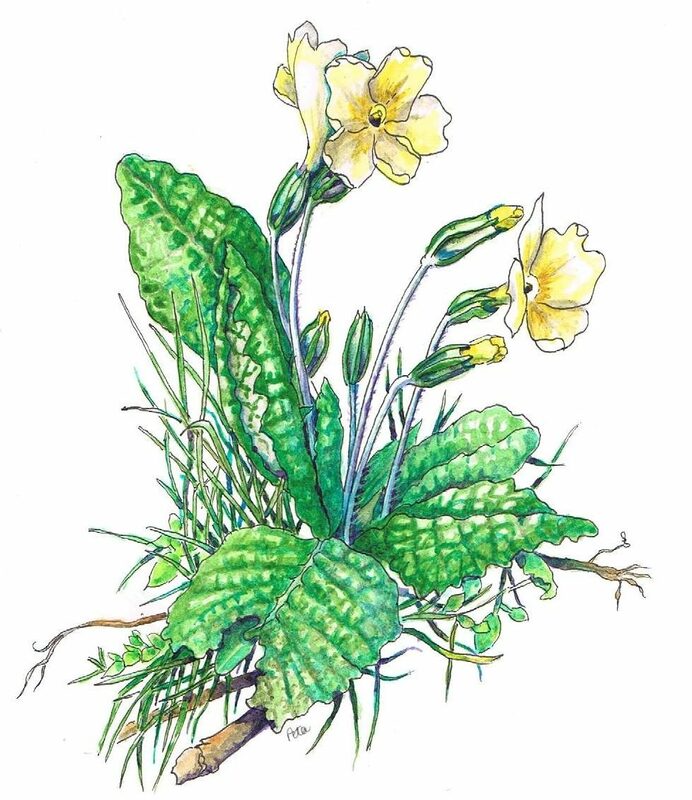 As we came out of the woods back into parkland and more sunlight the grassy banks were full of flowers – stitchwort, ground ivy, celandines, ladies smock and violets to name but a few. Inspiration for a new watercolour sketch . . . .
Beautiful sketch and watercolour. Are you a botanical artist? Previous The birds. . . . . . .